With their excellent quality and value replacement fork stanchions, Paolo Tarozzi is now the largest replacement fork manufacturer in the world. Manufactured in Italy, these replacement fork stanchions are made to the same specifications as the original equipment, with a reliable and corrosion resistant hard chrome finish - not soft 'show chrome' as is original on some motorcycle models. 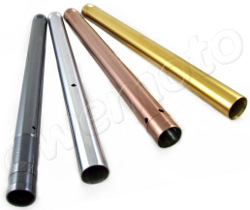 In addition to the standard chrome finish, coloured fork stanchions with a hardened titanium nitride coating in gold, copper or black is available for many models. If new fork oil seals seem to be failing in no time at all, it's time to inspect your fork stanchions. An uneven surface due to wear and tear, dents or rust will rip up even the best quality fork oil seals as they slide across the fork, leading to oil leaks (an MoT failure point). It is possible to polish out mild corrosion, but with anything worse, often a complete rechrome, or replacement, is required. Often it is only marginally more expensive to have a brand new set of chrome Tarozzi fork tubes than it is to rechrome and restraighten old, worn forks. As fork stanchions endure the stresses of everyday riding or heavy breaking, they will flex and eventually retain a slight curve - this will not only cause additional wear to the seals, causing them to fail prematurely, it will also affect the handling of the motorcycle. A creased or dented fork can never be restraightened and will always require replacing with a new fork stanchion. 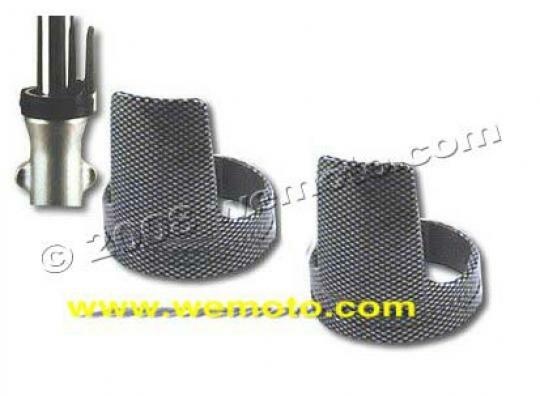 Wemoto highly recommends using ACF-50 Anti Corrosion Formula for protection in all varieties of weather.